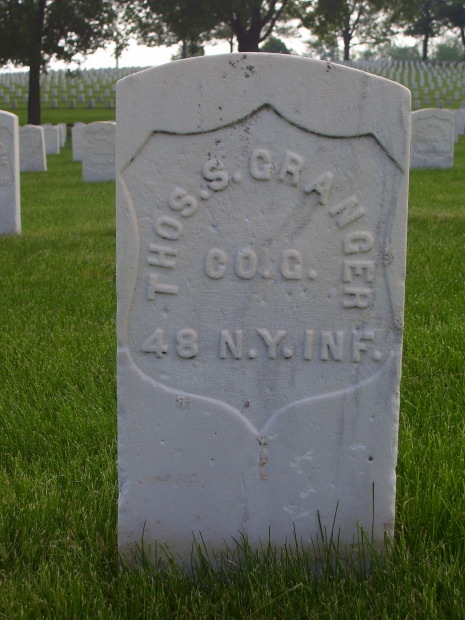 Thomas and his brother, William H. volunteered to fight in the Civil War, joining the 48th N.Y. on August 19,1862. Both served through the war. Thomas was wounded in the right leg late in the war, and was discharged from Mower Hospital July 7, 1865. William H. was discharged on June 27, 1865 at Raleigh N.C. In December of 1896 Thomas packed the three children off to in-laws, and checkedd himself into The National Home for Volunteer soldiers. He lived in three different soldiers homes and finally passed away in Dayton, Ohio on January 23, 1916. Thomas is buried in the Dayton National Cemetery in Dayton Ohio section 1 row 14 site 29. Thomas is buried in the Dayton National Cemetery in Dayton Ohio section 1 row 14 site 29.